Starts with Petra having an internal monolog trying to figure out how to rebuild a motorcycle, including a sidecar for her animal companion Sig.Ends, once again, with me saying "poor Cal." Lots of stuff happening in this second book. Too much to tell without spoiling it for you. I'll do my best.We're back with Petra and her loyal companion, Sig, and they are quickly drawn into the mystery of a giant serpent slithering through the park, killing in horrific ways. The hunt is on.And Gabe and the other Hanged Men are also hunting the Basilisk. They need its blood to save the alchemy tree that gives them life. It's dying and the serpents blood might be their last chance to save it, and themselves.Something kept me from falling immediately in love with this one. Not sure what, but by the end, the author got five stars out of me. I adore Petra, Sig, and Gabe. And she always gives me the most spectacular villains to vote off the island.I'm in luck and have the third book sitting right beside me. Off to more mad adventures and danger with some favorite characters. This is my last book of 2017 and I'm ending on such a great note. I loved the first book in the series and this one was even better. It's been two months since the end of book one. Petra is still working as a geologist for Yellowstone and she's been called in on some strange deaths as the rangers wonder if this could be related to all the new seismic activity and new fumaroles and mud pots (i.e. the sulfuric gases) but it’s like nothing she’s seen. The people are red and beginning to dissolve. She has no idea what is going on and she’s missing Gabe, one of the Hanged Men, the undead foot soldiers of the alchemist Stroud who died in the battle to end Stroud. She’s also still looking for her father who cast his mind far from his dementia ridden body thanks to alchemy. Even Frankie, the transgendered Native American shaman hasn’t burn able to help her.In the meantime, Gabe and the Hanged Men (who can turn into ravens and they’ve lost some of them) are struggling. Without Stroud, the Lunaria and the tree of life that keeps them alive is dying. Gabe has huge gaps in his memory and he fears Petra but he doesn’t know why. He can’t remember her. He is tracking a basilisk in the park because as one side delievers fatal venom (which is killing the people Petra is investigating) the other side gives the elixir of life which will save them.And against all of this is Cal, the luckless goth kid from book one. He’s been infected by the living Mercury Stroud commanded. He’s dripping mercury and cannot control it. When he sought out Petra for help, it kicked off a chain of events that leads to him riding with a gang of biker women, the Sisters of Serpens. Most are disaffected and/or abused women but their leader, who they follow without question is Bel and she has enough magic to control the Mercury.Eventually Petra, and her tame coyote, Sig, will cross paths with Gabe and time is running out for all of them (and Cal, trapped with murderous Sisters). If you want an intelligent strong female lead, Petra is it. She doesn’t do stupid crap and need rescuing and for those tired of the super-sarcastic snark fest so many UF heroines tend to offer up, this is a nice break. Yeah there is some of that but it’s not a constant. Petra is a scientist and tends to take that approach. There isn’t a huge romantic subplot, a hint of one but that’s it.The ending is a bit bittersweet but that is very organic to this story. The action at the end was pretty darned well written (not always easy to do). I can’t wait to see what comes next. I love this series and I wish it had a wider audience. I got mine from the author, herself, at the Ohioana book fest and she is so nice to talk to. Petra is the strong smart UF heroine done right. This series needs more love. Summary from Goodreads:"Something venomous has come to Temperance …It's been two months since Petra Dee and her coyote sidekick Sig faced off against Temperance's resident alchemist, but things are far from quiet. When an Internet video of a massive snake in the backcountry of Yellowstone goes viral, a chase for the mythical basilisk is on. Monster hunters swarm into the area, and never one to pass up the promise of discovery, Petra joins in the search.Among the newcomers is a snake cult on wheels―the biker gang Sisters of Serpens. Unlike some, the Sisters don't want to kill the basilisk―they want to worship it. But things get complicated when the basilisk develops a taste for human flesh that rivals the Sisters' own murderous skills.Meanwhile, the alchemical tree of life is dying, and the undead Hanged Men of Temperance who depend on it know the basilisk may be their last chance for survival.With time running out for everyone around her, Petra will be forced to decide who survives and who she must leave behind in this action-packed sequel to Dark Alchemy. "My Thoughts:I was absolutely thrilled when I heard that this book was coming out! I had previously enjoyed Dark Alchemy (the first book in this series) so much and had my fingers crossed that the author would be writing a sequel. So you can imagine my surprise and excitement when I got wind of this book. This series is so completely original and is just different from everything out there! I find it a treat to read and this has been my experience with both books in this series. I should say that you need to start off by reading the first book in this series because events in this book are a continuation from book one. Not all of it which means new readers could start with this book if they wanted but I just feel like they would be missing out a bit. And personally I feel like that this is such a great series and shouldn't be missed! I love how the author takes the impossible and makes it possible with these books. I just cannot emphasize enough how fresh and unique these books are. It is a mish mash of genres in the best possible way: a mystery mixed in with fantasy along with some steampunk elements and a western feel all rolled into one. I love it so much for all of these different reasons (and these are the same things that I loved about book one)!In this book Petra once again finds herself caught up in a heap of trouble as she attempts to help investigate the mysterious deaths of a family that have died for no apparent reason. She is looking at the geological features of the area trying to determine if a hot gas spot is the reason behind these deaths or could it be the mysterious snake that was sighted in the area. Almost instantly things start to go wrong and Petra is forced to search for answers while trying to keep herself out of danger. I found myself immersed in this book immediately after starting it....it was just that easy to fall back into the world that Bickle had created in Dark Alchemy. I loved that we had the chance to meet up again with all of my favorite characters from the previous book. I especially loved that this book delved more into the mysterious hanged men and their fate after the way that things had ended in book one (trying not to spoil anything here so sorry if I'm being too vague). This book was just as fast paced as the first book and just as hard to set down. Basically I just loved this book as much as I did the first and am now a huge fan of this series! And the ending- what an ending! I loved that we got some answers but I also really loved the set up for the next book. There is going to be a next book!!! I cannot wait!Overall, I just cannot say enough good things about this series or about this book! I hope that other readers are reading and loving this series as much as I have. Trust this author to take you on a wild ride that will keep you on the edge of your seat the entire time. Now I'm just going to have to patiently wait and wish for the next book in this series. Highly recommended!Bottom Line: Such a great follow-up to the first book in this series! I cannot recommend it enough!Disclosure: I received a copy of this book thanks to the publisher and Edelweiss. Mercury Retrograde is an excellent addition to the Dark Alchemy series by Laura Bickle. I enjoyed this one as much as the first book. My attention was captured on the first page. I never lost interest throughout the story. It was fast-paced, exciting, dark at times, and humorous at other times. It’s a great mixture of a thriller, romance, and a dark fantasy, with a unique cast of characters and an atypical setting.I enjoyed how Laura Bickle mixed different mythologies with alchemy. For example, she tied the mythological creature, the basilisk, into a new system of magic by showing how the basilisk was represented by an alchemical symbol. To me, everything fit together and made sense. The author even gave a reasonable explanation for why a geologist would be asked to hunt down a giant snake.I also liked how the author worked in enough backstory for new readers to jump into the series. It is not necessary to read the first book, although I do suggest it because it’s a great book.Another aspect of the book I enjoyed was the mixing in of geology such as seismic disturbances and geothermic activity coinciding with the awakening of the basilisk.Petra is an interesting character, much different from many other fantasy heroines, because she doesn’t have any special gifts or abilities, perhaps except for being able to travel to the spirit world on occasion. For the most part, Petra is ignorant when it comes to magic.I thought there was a good set up for the next book in the series. The main threads of this book were wrapped up, so I wouldn’t call it a cliffhanger. However, the author introduced some new problems at the end that got me excited about reading the next book when it comes out. There was one thing that was left hanging–Petra’s unusually high white blood cell count–that I hope will be resolved in the next book.My favorite line of the book was at 84%: “This could, quite possibly, be the dumbest thing she’d ever done: pursuing a poisonous basilisk into a cave during an earthquake in the company of a bunch of dead guys, armed with a potato cannon and a six-pack of lye.”I strongly suggest reading Mercury Retrograde. I give it 5 stars for intense action, believable scenarios, and a satisfying conclusion. *I received a free copy from Edelweiss in exchange for an honest review. I love Laura Bickle! She is just fantastic, and I love that she is so different from any other author on the planet. I have read just about everything from her, and when I read the first book, I was really hoping I would get more. And yes I did! Book two may be just as good if not better as book one! There's a little time that has past since book one, and there's a little recap from book one in case you haven't read it. But I so vote to read book one, not because you would be confused but because you would be missing out on great story telling by Ms Bickle! And I love Sig LOL So, Petra and Sig are back, and there's a snake... a freaking big snake... and it's taken over Yellowstone. Oh, and someone decided to take videos and put them all over the internet, so now, tourists are showing up in hoards, and even monster hunters are tagging along, everyone wants a video for themselves, or the "say" of catching it. Now, with all these other people come Gabe and his Hanged Men tribe, who are looking for the snake, not for fame but for life. They need the snake to help them save their tree. And to help keep them on their toes are a women run biker gang who worship snakes and they think the snake should be fed, not killed... So, they will use people as food. EW! And WOAH!I love the characters in here. All of Ms Bickle's characters are so well written and in depth. They have the complexity that makes them feel so real. And you never can predict exactly what they are going to do next. And the world building and supernatural parts are always so unique and creative. There's so much goodness about this book, and this series. I think you should read this one! NOW! LOL 5 PAWS!!! I can't wait for more, please say their will be more! Note: I ended up reading book 3 before I touched book 1 or 2. I tried to pretend this didn't happen when I read this book.Much of what I liked from the other book holds true in this one as well: setting, mood, characterization. Additionally, I enjoyed the adversaries in this book, the Snake Sisters. Though they were pitted against Petra and Gabe's goals and had their own moral code, they garnered sympathy from me, even if they were extreme. I am glad that Cal and the aftermath of the confrontation with the Alchemist and ensuing explosion weren't cut out of this novel. It creates a sense of continuity between books 1 and 2. Once again, poor Cal! That kid can't catch a break! Though towards the end of the book, he does something which I will not say because of spoilers that shows his growth as a character. Though Gabe is missing his memories of Petra throughout most of this book, when he does regain them, we get to see more into his thoughts and emotions regarding her than in the first book. Overall, the author does a good job at portraying realistic growth in relationships, whether its Gabe and Petra or Petra and her father. That being said, my main downside to this is that I wish it were a little bit longer. I think that the Gabe and Petra angle would have benefited from even about 15 pages more space. I LOVE THIS SERIES AND THIS AUTHOR! Each series Laura Bickle writes is a unique voice. Dark Alchemy is especially intriguing with its magic and mythology in a weird Western big ol' mixture of superb! I was hoping that there would be a return to hang with Petra and her world and I got my wish. This is just a fantastic sequel to DARK ALCHEMY. Petra is still reeling from the events that led her to this neck of Yellowstone and what occurred once she arrived. Now she is asked to accompany a team to help round up a giant snake that was a result of magic and alchemy. There is also the issue with the Alchemical Tree that continues to decline. Without the Tree, the Hanged Men can't continue, so what will become of Gabe, Petra's mysterious man? It will also diminish her capability to search for her missing father. To go anymore into the tale is to tell the whole story. It is written so vividly that I could envision the death and mayhem, feel the heat of the desert, the roughness of Sig's coyote fur, the texture of mercury. I can only hope that there will be more books to the series. I love it and highly recommend it. I'm a total fanpiggy when it comes to Laura Bickle, so it might not surprise you I got my trotters on this book as soon as I could. I even debated if I should get the ebook, so I could read it sooner, but I wanted the print version to hug and pet. And this book was worth the extra wait.I love Petra and Sig, they're an awesome team. Petra has had enough happening to her she's sensible and smart. She doesn't just run into things blind. That doesn't mean she's not caught by surprise at times.There's lots going on: a big nasty basilisk, the tree of life is dying, Gabe not recognizing Petra, and lots more. I was hooked from the start. Will Petra be able to defend herself when she encounters the basilisk? Will Gabe recover his memories? Can they help each other stay alive? And what's going on with Cal?This book is action-packed and at times grim. I feared for the life of some of my favorite characters. There are wins and losses along the way, and the ending gives hope and closure on some things, but also gives a glimpse of more nastiness coming Petra's way. You can bet I'll be getting my trotters on the next book! I actually think the first book in this series is a little better, but this is a solidly enjoyable follow up and it definitely sets things up nicely for a third book. Nothing here is bad, it's just that the character stuff with Petra doesn't feel like it expands on anything much and while the biker gang is fascinating ultimately it feels like more could have been done with them. Or, basically; what's here is good, but like 75% of the way through I realized some of the stuff I thought would get expanded on wasn't going to be. Not necessarily a huge problem (I did still enjoy it), but it made this one feel a bit transitional. I do like what happens with the hanged me, though. This sequel to Dark Alchemy is a fun fantasy adventure, though I didn't like it nearly as well as the first book. With a lot of interesting characters to choose from, this one focuses too much on Cal, and I never really could get myself to care much what happened to him. 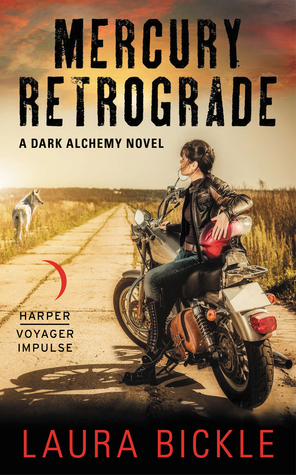 The mixture of science and mythology is well handled, and the motorcycle gang and Gabe's partners are quite entertaining, as, of course, are Petra and her sidekick Sig. (Her homemade weapon is terrific.) Altogether a fun read, though it bogged down a time or two when Cal was on stage. The sequel to Dark Alchemy, Laura Bickle kicks up the writing a notch or seven. Even better book? Yes, as if you enjoyed the first book, you are already invested in all the quirky characters of Temperance Wy. All women biker gang/snake goddess cults? Check, crazy alchemy emo boy subplots. Romance with a dead zombie tree man in a nice hat? Yes! Giant snake goddess who just wants some adoration? Yup. Looking forward to any more adventures in this weird alchemical western world! I liked this but didn't love it like the first book. I don't know exactly what it is, its as dark and fantastical as the first book, but I wasn't as engaged. If this is just a duology, I'm happy with the ending. its bittersweet and wrapped the storylines nicely. Really enjoying this fast-paced series. Unique Yellowstone setting combined with alchemy, a heroine who's a geologist, the spooky Hanged Men, snake cultists and a basilisk. Really interested to see what happens in the third book in the series. While not as captivating as the first volume, Bickle's imagination and heart are present on every page, and she certainly leaves readers anticipating a sequel. Laura Bickle - Laura Bickle grew up in rural Ohio, reading entirely too many comic books out loud to her favorite Wonder Woman doll. After graduating with an MA in Sociology – Criminology from Ohio State University and an MLIS in Library Science from the University of Wisconsin-Milwaukee, she patrolled the stacks at the public library and worked with data systems in criminal justice. She now dreams up stories about the monsters under the stairs, also writing contemporary fantasy novels under the name Alayna Williams. Her work has been included in the ALA’s Amelia Bloomer Project 2013 reading list and the State Library of Ohio’s Choose to Read Ohio reading list for 2015-2016.